The 82045 Steam Locomotive Trust is proud to announce that His Royal Highness the Duke of Gloucester has kindly agreed to become a Royal Patron of the Trust. Trust Publicity Officer Chris Proudfoot, said “We are absolutely delighted that the Duke has agreed to become our Royal Patron; this is a sign that the project is held in high regard and we are most grateful to the Duke for accepting our invitation". Looking back over the year, 2012 began with the footplating around the front of the loco being manufactured by our own team and fitted. The various footsteps around the loco and injector support brackets were also made and fitted and by the Spring the chassis looked quite presentable. However in order to prepare for riveting the chassis together we had to start partial dismantling in order to remove any rust that may have begun to form on the various joint faces between the stretchers, smokebox saddle and main frame plates. The front half of the chassis was thus attended to and the smokebox saddle and front radial arm support stretcher are now riveted into the main frame plates. 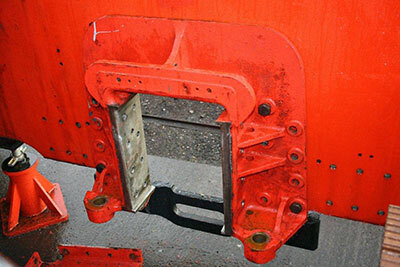 The motion brackets have been bolted to the frames and recently had the mounting holes reamed preparatory to riveting. The brake hanger brackets have been cast and machined and the conecting rods forged. A great deal deal of time has been spent on preparing the manganese liner plates and fitting them to the horn guides and horn blocks. Likewise the manufacture of cold rivets has been and will continue to be a time consuming job for some time yet. In December riveting of the horizontal stretcher in front of the smokebox saddle has begun. Holes have been prepared on the stretcher to the rear of the saddle.The holes through the motion brackets into the vertical stretcher between them are curently being reamed to size and the rivets are being made. Elsewhere in the machine shop the brake shaft brackets are being machined. 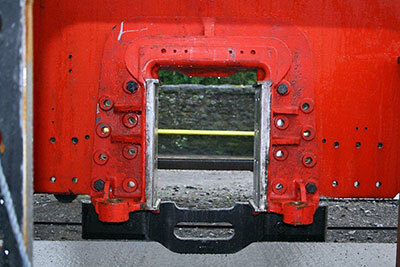 An order has been placed for casting the brackets which support the driving wheel springs. 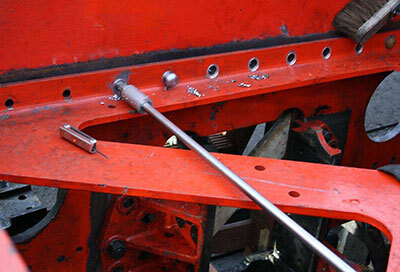 The hornblock for the centre wheelset temporarily bolted in position on the right hand side of the chassis. The tool constructed by our own team for facing the periphery of the rivet holes on the horizontal stretcher behind the smokebox saddle. I am happy to report another year of excellent progress on 82045, though to the casual observer it may have seemed as if the project actually took a few steps backwards in the latter part of the year, with the front end stripped of valances and buffer beam. I can assure you that nothing could be further from the truth and that we are in fine fettle. Tony explains, in his Engineering Notes, that this partial disassembly was carried out in order to facilitate riveting, initially around the smokebox saddle. At the time of writing, getting on for two hundred of the notoriously difficult cold rivets are already in situ. As Colin Williams remarked recently, “After this, the hot rivets will be a doddle!” At the same time, the opportunity was taken, using heavy block and tackle, to bring the frame plates into precise alignment: the engine is being built to Rolls-Royce standards, which should pay dividends when it enters traffic. Regular working parties have met throughout the year, the main working day being Monday, though some members of the gang also convene on Wednesdays. A gantry was rigged up early in the year which can be moved up and down the length of the frame structure as required, and this was fitted with an overhead wooden frame to support the sound-deadening composite used during riveting operations. The summer was, of course, a wash-out, and an unexpected bonus for us was being able to use the frame as a roof over which a tarpaulin can be thrown to enable work to carry on in inclement weather. At this point, I must pay tribute to the engineering excellence and expertise of our working team, which now regularly numbers at least a dozen people, each bringing his own skills to the project. It would make for boring reading to recite lists of names, but, to mention two, this year alone we have been joined by skilled engineers Alan Harris and John Paget, both of whom have fitted in immediately with the rest of the team and are making a valuable contribution to its work. We have been very fortunate indeed to have attracted such an array of talent, and just as fortunate that there is no-one who nurses a fragile ego, so that the working atmosphere is generally pleasant! It is very difficult to quantify the value of all this home-grown practical ability and, at times, sheer ingenuity, but, as the chap in charge of everyday finances, I can promise you that it is really enormous and enables me to make sparing use of the cheque book and so stretch our finances to the utmost. Thank you so much to all concerned. The Trust, as a result, closes the year with a healthy bank balance, despite the unplanned expenditure on the connecting rod forgings (see November updates) and the acquisition, mid-year, of a good number of BR Standard valve fittings. These were both opportunities we could not afford to miss. Even allowing for these two important purchases, I am glad to report that the money for the complete cylinder job (pattern-making, casting and machining) is safely salted away in its own account, and that, thanks to the success of the Wheel Appeal, we are now in a position to have the driving wheels cast – the first, and most expensive, stage in the wheeling process. Tony will be seeking competitive quotes for this job early in the New Year, while I do my best to maintain the momentum of the Appeal in order to raise the money for axles, axle-boxes, tyres and machining. We have established friendly contact with another loco group (not on the SVR) whose engine shares the same rear pony truck assembly with 82045, so we are hopeful of progress on that front in the New Year, too. Away from the construction site, we continue to gain new members at a steady rate, and Barbara is hoping to be able to announce at the 2013 AGM that numbers have passed 500. Again, thank you to all of you who are supporting us so generously; and to those of you who haven’t yet taken the plunge, please think about joining us. Monthly standing orders are a wonderful way of helping 82045, and a reliable income stream enables me to plan our finances with a high degree of accuracy and therefore to commit expenditure with confidence. Even £5-00 a month is a worthwhile amount, and Gift Aid - for UK taxpayers – raises this to £6-25. Not much, you might say, when you consider the amounts of money involved in the project, but, believe me, it soon mounts up and such support is invaluable. And what about our plans for 2013? Well, it would be unwise for me to stick my neck out too far and thereby make a bigger fool of myself than I already am; but we think it is reasonable to predict that the wheeling process will be well advanced by this time next year. I am sometimes accused, by my literal-minded engineering colleagues, of being too simplistic about the hugely complex job of building a brand-new standard gauge steam locomotive….but I am starting, cautiously, to see the way forward to “that happy day” (as Tony described it recently) when we gear ourselves up for the boiler. No more on that front for now, though! As you will read elsewhere in the December updates, the Trust is both honoured and delighted to report that HRH The Duke of Gloucester has accepted an invitation to become our Patron. This will undoubtedly raise the prestige of the project, and draws us still further into the SVR fold as the Duke is also Patron of the Severn Valley Railway. Very many thanks to our colleague Tony Cousins, who has worked hard behind the scenes to bring about this excellent development. Finally, it remains only for me to remind you that the 2013 AGM will be held on Saturday 6th April at Kidderminster Railway Museum, and to wish you all the very best for the coming season and the New Year. Floreatis omnes et floreat 82045!